Do your best. Persevere. Never give up. These are values that resonate with the Japanese. You see it in the office worker who stays late to get things done, night after night. You see it in the high school baseball player who dives left and right after dozens if not hundreds of ground balls in the rain. You see it in the artist who tirelessly works the pottery wheel until she gets the exact curvature in the clay she sees in her head. Kokichi Tsuburaya exemplified those values. And when he drove toward the finish line of a grueling 42-kilometer marathon race at the 1964 Tokyo Olympics, on the verge of grabbing a silver medal in track and field, where Japan had found no success, 70,000 Japanese shouted and screamed their encouragement, attempting to will Tsuburaya on to a strong finish. And yet the drama laid out before the spectators had the sickly feeling of inevitability. Just as Tsuburaya emerged from the shadows of the tunnel entrance, a few meters behind so too did Basil Heatley, a Brit hot on the Japanese’s heels. When Heatley accelerated past a depleted Tsuburaya like a biker passing a pedestrian, the growing balloon of hopes an entire nation held for Tsuburaya seemed to deflate in those seconds it took Heatley to get to the finish line. It must have been a tremendous disappointment. Of course, Tsuburaya was a product of his national cultural traits. But more impactfully, he was his father’s son, as described in Ichiro Aoyama’s book, The Lone Runner – The Kokichi Tsuburaya Story. Little Kokichi at 7 years old, smiling front and center. 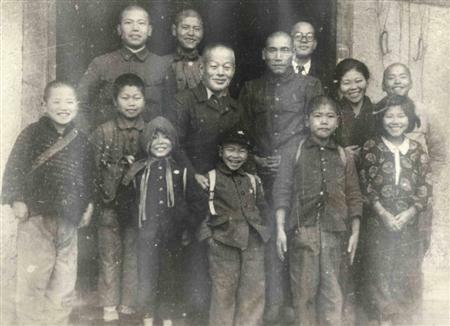 The seven children in the Tsuburaya household had to work hard, cleaning the house, preparing the bath, cooking, planting the rice, raising the livestock when they hit the age of 10. These were not easy tasks, and the head of the household, Koshichi Tsuburaya, believed that his children needed to be disciplined to ensure they did their chores. He ordered his children around military style, shouting directions like “Attention!” “Right face!” “Go Forward!” He made them wear shorts in the winter. He made his children repeat chores if they weren’t done properly, and of course he would hit them to make sure they knew they had done something improperly. Training included bayonet skills, just in case. As a child Kokichi liked to run, and when his dog ran, little Kokichi liked to try to keep up with the dog. But one day, when he was 5, Kokichi felt a sharp pain in his legs and his back. The father (named Koshichi) then noticed that their boy’s left leg was shorter than his right. Knowing how little their little Kokichi would complain about anything, the parents took him to the hospital, where they learned that their boy also had tuberculosis arthritis, which causes pain in the weight-bearing joints of the hips, knees and ankles. So from an early age, Kokichi felt pain whenever he ran. And yet, Kokichi loved to run. He looked up to his older brother, Kikuzo, who ran competitively. Kokichi often joined his older brother, and the elder brother saw the kid brother keep up, despite being 7 years younger. The brothers would often go for runs in the evenings. But their father didn’t approve of running for the sake of running. “You can’t live off of running,” he would say as a warning to his sons. One time the brothers came home a little later than usual, and the entire family was seated at the dinner table quietly, waiting to start eating until the two boys sat down. The father kept quiet until the boys returned late again from running, and again told his boys angrily, “You can’t live off of running.” In order to avoid the glare of their father, the boys would sneak out for a run while their father was taking a bath. Kokichi never quit. In fact, he took his commitment to running very seriously. In high school, he trained very hard for a national 5,000 meter competition. He did not win, and without anyone’s urging, shaved his head to account publicly for his loss. When Kokichi graduated from high school, he did something that made his father proud – he joined the Ground Self-Defense Force and became a soldier like his father had been. Japan has a long tradition of long-distance relay races, and Kokichi was slated to join the team representing the Self-Defense Forces in a national long-distance race. At the time of the race, Kokichi was in the hospital with a high fever. On top of that, Kokichi kept the fact that a slipped disk in his back was also causing him tremendous pain. 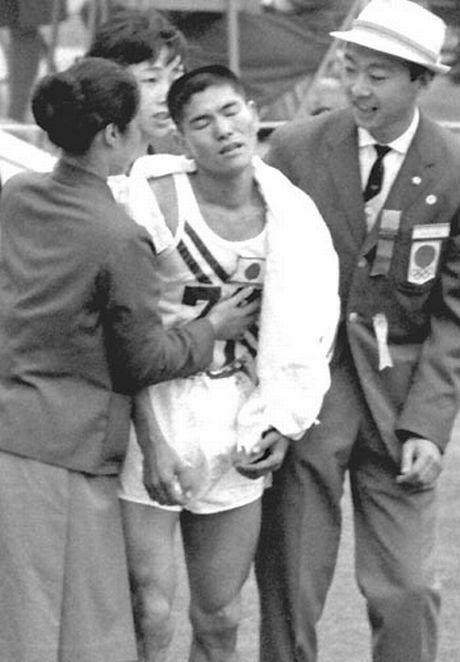 Despite all that, Kokichi Tsuburaya insisted on running the longest leg of the race. It was this commitment, this perseverance that eventually endeared Tsuburaya to the public. And through it all, even his father, who thought nothing would ever come of his running, was quietly very proud of his son. His father would often send Kokichi letters of encouragement, saying how worried he was for his son. And when Kokichi returned home from his bronze-medal finish at the Tokyo Olympics, he was surprised to find that his parents kept all sorts of newsclippings, medals and trophies of his accomplishments , or could not sleep on the eve of the Olympics, and worried deeply about his health. They were deeply proud of their little Kokichi. And likely, so was an entire nation. Posted in Japan, Tokyo 1964, Track and FIeld and tagged 1964 Tokyo Olympics, akiramenai de, Basil Heatley, Do Your Best, gambatte, Kokichi Tsuburaya, Koshichi Tsuburaya, marathon, Self Defense Forces. Bookmark the permalink.